BEFORE: Onto the second movie today and wrapping up The Matrix trilogy we. Have The Matrix Revolutions. I don’t want to say too much beforehand. I will note that this film was shot at the same time as the first sequel and was released six months after in November of 2003. AFTER: Some expectations were met but some were also exceeded. Coming into the last film in the franchise, I was expecting it to be the worst of the three. Most critics of the series have the most problems with the last film. While there were certainly many problems I had with the film, I was quite impressed by how entertaining it was. Compared to the second film, The Matrix Revolutions was actually less confusing. There is still lots of information and details but it was much more easy to understand. One reason this may be is the amount of new information was less. In Reloaded, a whole bunch of new characters, or programs, were introduced including the Frenchman, the Keymaker, the Architect, and the citizens of Zion. In Revolutions the only real new characters was the Trainman; all the others had been introduced in the previous film. So while there was still info dumps and confusing philosophical monologues, the familiarity helped with comprehension. So in this regard, the film was better than expected. However, the film was also as expected (read: bad). The biggest issue I have with The Matrix Revolutions is the structure of the film. There is way too much time spent following one story line and it gets tiring. In the beginning there’s a good balanced between the various things going on (in Zion, the Matrix, and the ships) but after about a third of the way through, the variety ends. The entire middle of the film is dedicated to the battle for Zion, the first battle anyway, and it never cuts away. Neo (Keanu Reeves) and Trinity (Carrie-Anne Moss) are traveling to Machine City but they’re just forgotten for a big chunk of the movie. It’s just Zion and the implausible amount of sentinels attacking the defense. And then the ending is just Neo as he confronts Smith (Hugo Weaving). At least for this part there are some brief cutaways to Zion and people’s reactions to what they imagine Neo doing. All-in-all, my recoomendation from the last film still stands. Definitely watch The Matrix. 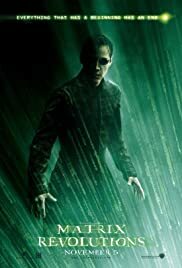 I still consider The Matrix Reloaded and The Matrix Revolutions supplemental and non-required viewing material but I will revise my opinion. The sequels, while they don’t live up to the original, are actually better than I remember them being. There are many issues with story, pacing, and otherwise, but the sequels are decent additions.